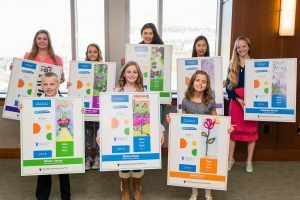 Eight students from across Utah each won a $1,000 UESP college savings scholarship account for their unique bookmark designs in the 2016 “Make Your Mark” bookmark contest. The contest, sponsored by UESP and StepUp to Higher Education, runs each September as part of College Savings Month. Winners in the K-3 category were Sophia C., a second-grader from Adams Elementary School in Logan City School District; and Walker H., a third-grader from North Davis Preparatory Academy in Layton. Fourth- through sixth-grade winners included Eliana Z., a fifth-grade student at Wasatch Elementary in Salt Lake City School District; and Kennedy L., a sixth-grade student at Freedom Elementary School in Alpine School District. Two students from Midvale Middle School in Canyons School District won the seventh- and eighth-grade category: Zoe L., a seventh-grader; and Elizabeth M., an eighth-grader. High school students Mia H., a sophomore at Sky View High School in Cache County School District, and senior Aliyah H. from Jordan School District’s Herriman High School won the 9-12 category. The winners were honored at an awards luncheon held November 7 at Zions Bank headquarters in Salt Lake City and can use the funds at any college, university, vocational or technical school in the United States or abroad that participates in federal financial aid programs.